‘Gaslighting’ is a term coined fairly recently to refer to a kind of behaviour displayed by abusive individuals (particularly domestic and intimate-partner abusers) in which they use tricks to cast doubt on their victim’s mental health or grip on reality; they will commonly accuse them of imagining things when confronted about the behaviour or when they point out the signs of it. Its origin is the 1938 play Gaslight by Patrick Hamilton, adapted into a film in 1944 which starred Ingrid Bergman as opera singer Alice Alquist, in which her husband ‘Gregory’ (who was really Sergius Bauer, her aunt’s murderer) isolates her, plays tricks on her, moves things from the house and pretended it was her, and uses the house’s gas lights to search the attic for the aunt’s jewels. His aim was to have her certified insane in order to continue his search for the jewels unimpeded. He is eventually foiled when his wife is brought into contact with a police inspector who noticed her resemblance to her murdered aunt which rekindled his interest in the unsolved murder, and eventually visited the house when the husband was using the gaslights to rummage around in the loft, confirming what Alice had been seeing all along. However, the term has come to be used more loosely to mean any kind of manipulative behaviour or simply disagreeing with someone with strong emotions or who feels wronged. 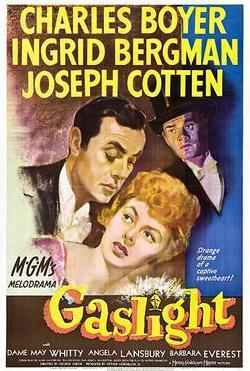 The other day I saw a tweet thread which protested against the use of the term ‘gaslighting’ to mean any kind of manipulation or misrepresentation of the facts, when in fact “a single comment from a total stranger cannot gaslight you”. I have personal friends who have been in violent or abusive relationships in which gaslighting was used and some of them find it offensive to see it used trivially, or to mean other frustrating behaviours such as minimising, disbelief, or simple misunderstandings. As one of them said in a 2013 blog entry, “I don’t think it’s too big a step to suggest that it’s also hurtful to suggest the experience of being acutely mentally tortured is equivalent to someone having gotten the wrong end of the stick and run with it”. Yet we see articles on ‘gaslighting’ being circulated on social media all the time, often on feminist websites, often claiming that gaslighting can be unintentional — that it is characterised by how the person on the receiving end feels, not what the supposed perpetrator intended or even actually did. I’ve been on the receiving end of ridiculous accusations of gaslighting twice. Once was when a former friend was tweeting that her friend’s content, which had been published by agreement with an Australian publisher, had been rewritten by the Daily Mail and published on its own website. I suggested that her friend’s publisher might actually have sold it themselves, and my ex-friend told me “please do not gaslight her”. I had not actually met her friend or in any way communicated with her. (I later found that I was mistaken and that Mail Online do this on a grand scale.) Said ex-friend once told me that she had never experienced sexism, but since coming into contact with Australia’s community of media feminists, delights in throwing around the neologisms feminists have coined to shut down disagreements from men. In the other case, an American feminist writer who writes a lot on domestic violence and abuse and who I don’t doubt knows what gaslighting actually means accused me of it when she lost a number of followers, attributing it to white women not being able to stomach her views on race. I suggested that it was down to Twitter purging inactive accounts, which had lost me a number of followers that same week. In both cases this was someone who presumed herself to be my intellectual superior — an actual published writer rather than a self-published blogging oik who dared to question her — used it inappropriately as a put-down. As a commenter on the above entry noted, it was the equivalent of telling someone “You’re wrong in a way you’re not even clever enough to understand!” when actually, I do know what it means and it did not mean what they were suggesting. In other cases, the claim has been made of people in the media disputing widely-held perceptions; we heard it during the Labour anti-Semitism dispute in which someone called Victoria Freeman posted a widely-retweeted thread calling an article by Jeremy Corbyn “the most obvious example of gaslighting I’ve ever seen” when in fact gaslighting is often done in private and is rarely obvious to the untrained eye and besides, telling a community that they or their friends do not have a right to oppress others is nobody’s definition of abuse. We also see feminists opposed to the recognition of trans women as women accuse their opponents of ‘gaslighting’ them. Sometimes the similarity to the original definition is so obscure as to be unfathomable, but generally it is used as if it means telling people they are wrong, or that what they think they are seeing is actually something else, which can actually be true of something large numbers of people believe they are seeing or experiencing, such as immigrants taking their jobs or “their women”. The essence of gaslighting is that you are telling someone they are imagining something you are doing, or you know your friend is doing. Deliberate lying is inherent to it. Gaslighting is a coinage that is used widely by the same community as ‘mansplaining’, originally intended to mean a man patronisingly explaining something to a woman with the assumption that she does not know, or that he knows better, because she is a woman; the most egregious examples involve women who are experts in a field while the man has only a passing knowledge and things women know about by definition better than men (e.g. periods, childbirth, and especially the experience of them rather than the technicalities). However, it is often misused to mean “a man telling a woman something she does not want to hear”, essentially as an ad-hominem argument. However, while mansplaining is annoying (as is having one’s views, or attempt to engage in conversation, contemptuously dismissed), gaslighting is abusive behaviour and if you accuse someone of it inappropriately who knows what it means, you will cause offence and you cannot expect a polite or deferential response and it is not only that person you offend but anyone who has experienced the real thing. What came before “PC” policing?